This episode was the second pilot shot for the series. The only character to survive to this second pilot was Spock. Several other later characters are still missing or in different positions. 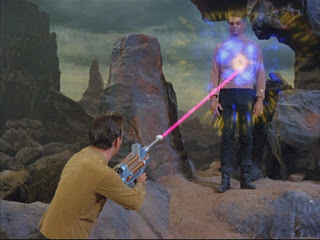 In this episode, the Enterprise, again following the signal of a lost civilian craft, travels to the galactic barrier, a mysterious energy field that surrounds the galaxy. Two crew members are struck by a strange discharge and begin to exhibit bizarre and increasingly terrifying powers. This was another great episode, again earning a five each from the both of us, for another perfect 10. The same qualities that made "The Cage" such a success are evident here. While many of the characters would not make it into the series, they still managed to convey interesting and textured characters in less than an hour. Both pilots did a fantastic job of establishing the series and are easily in the top ranks of the series as a whole. Today's podcast comes in at 1 hour 2 minutes and a file size of 57MB. Wow I am listening to the podcast and I have to say the audio is even nerdier and nitpicky and wonderful than expected. We'd love to hear your opinion of the episode, SirKatz!